Kyle Ruediger hasn't had the best of luck when it comes to injuries. First he injured his hip, suffering a hip contusion against Montgomery County and after that was heeled 12 days later he is sitting in the Emergency Room getting stiches. Tuesday night with 3:42 left in the third quarter Ruediger was running to help Austin Madden trap New Bloomfield’s Cam Edwards when he reverse spun away from the sideline right into Ruediger, colliding like two freight trains, leaving both players on the floor with blood rushing from their mouths. Both Ruediger and Edwards left the game not to return. Edwards spent the rest of his night getting stiches above his left eye. On the flip side, the Shamrocks had three players in double figures for the first this year. Ruediger scored a game high 15 points, followed by Seth Schenck’s 14 points, six assist, and four steals. Austing Madden drew his eighth charge of the year and third shamrock scoring in double figures with 10 points. Austin Madden knocks down two of his 10 points. 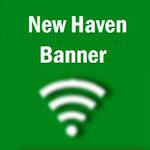 New Haven led by one going into the second quarter when the speedy demons kicked into high gear raddling off ten points in about two minutes while holding New Bloomfield to just two points. New Haven ended the half with a 13-point lead, 27-14. New Haven’s 20-point win over New Bloomfield marked the second this year they have scored double figures in all four quarters and committed a season low six turnovers. New Haven will play their last game before Christmas break at Silex. Steinhoff said he did not know a lot about them other than they had beaten Elsberry, who is expected to be a top team in New Haven’s district. Steinhoff also said that Silex is playing really well right now and it will not be an easy win Friday night. Like us on Facebook for some awesom photos from Tuesday night. The Shamrocks got the number one seed and will take on New Bloomfield once again. Click here to download both the boys and girls brackets as well as the 5th and 6th grade tournament brackets which will be held Jan. 5 & 6. Along with Seth Schenck's 14 points, he had a game high four steals, and went four of four from the line.